Now, you must be asking how come Truffles in the middle of these hot summer days? Well, first, it was about time that chocolate got back into my kitchen, be it black or white. Second, I was so delighted with the photo of Orange Creamsicle Truffles on the blog “Deliciously Yum” that the choice to make this Truffles was very simple. Since I had no oranges at home, I decided that lemon could be a great substitute. And when you put chocolate, truffle and hot days into the equation, the solution are exactly these White Chocolate Lemon Truffles. And like a few times before, the Truffles didn’t fail me in any sense (look at my Mummy and Pumpkin Truffles). First, it’s so easy to prepare them, that all in all it should take you about 15 minutes. But, you have to count in that the mix has to get cold and harden in the fridge for a few hours, but that is time you would spend anywhere. Of course, everything left after Marco was “gone with the wind”. in the stomach of my husband. “Vera, I was thinking of something. Are there truffles with black chocolate”? he asked with a cheeky smile. “Of course there are” I answered knowing what he was aiming at. And really, on my chocolate blog, there was no recipe for Truffles with black chocolate. i love white chocolate truffles. great flavor! These look simply delightful! Can’t wait to make these! I love this recipe! Instead of leaving them with just the powdered sugar, I like to enrobe my truffles in white chocolate. It takes a bit longer, but it’s worth it. I made them for my cousin’s wedding. I ended up adding lemon juice because I wanted it extra lemony. They turned out great. How much lemon juice did u add please? How much lemon juice did you use ? How much lemon juice did Ann add to the recipe? Did you still use the extract? Just making these now. I used 1.5 tsp lemon extract because I found 1 tsp to be a little too little. It was super easy to make, and is in the fridge now, cooling until tomorrow. I snuck a taste and it was DELISH!! Can’t wait unti they’re done! I love lemon. I love white chocolate! Thanks for posting this!! I think next time I’ll try using key lime juice! My other favorite truffle flavor! I’m looming to make these for Christmas and wanted to get a jump start on cookies an things that will freeze well. Does anyone know if these will freeze well till I’m ready to make cookie trays? OMG is right! These are as fantastic as they look! So easy! So delicious!…So addicting! So happy I found your blog! Stir until smooth. Around how much time? Or how thick? Hi Caludia, it will thicken in the fridge, stir 2-3 minutes. Can’t wait to try these!! I’ve been on a lemon binge lately..
Hi I’ve made the mix up and has been setting in the fridge for just under 2 hours now however I just tested consistency and found it quite sloppy and by no means rollable. Do you have any suggestions as to how I could thicken the mix now or something to add to make a more workable mixture?? I SOOOOOOOOOO want to eat this!!! Just made these lovely truffles, they turned out great. I added some tiny walnut pieces in the center, and the crunch was nice. Well I followed the recipe exactly, but after first 5 and now 18 hours, it is still like a rather soupy frosting 🙁 I’ve had great results with other truffle recipes, so why not with these? These truffles turned out way too sweet for my taste! What brand of white chocolate do you prefer? Thank you for any advice. Can you use white chocolate chips for this recipe instead of solid white chocolate? Is this solid white chocolate that you use called chocolate bark? Hi Barbara, I didn’t try this recipe with chocolate chips, so I suggest you to use a high-quality white chocolate. And be careful, melt the chocolate with butter and cream over a double boiler(it takes more time but do not overheat it or it will separate and be unseful). Yummy! I just made these today. So easy. I used white chocolate chips because that’s what I had on hand and it worked fine. Do u use heavy cream or sour cream? Hi Cristine, it’s heavy whipping cream. Hey Vera, perhaps the reason Christine, on March 6th, asked about sour cream is because sour cream is mentioned in the opening line of your post about the truffles? I noticed that too. So glad Christine asked! Maybe it needs editing? Haven’t tried the recipe yet … was forwarded and recommended to me today. Looks easy and tasty. 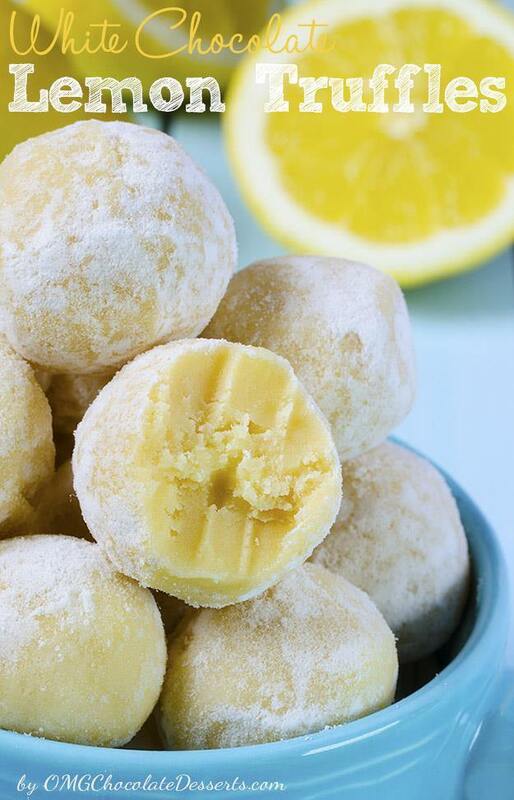 Just found your web page and the lemon truffles look delicious, Would the mixture be liquid enough to pour into chocolate silicon moulds prior to putting in the fridge to harden? If so, I am planning to then dip them in melted chocolate rather than roll in icing sugar. What do you think? Hi Ann, the mixture is liquid and you can pour it into moulds, only you might have the problem the fat separates on top. I decided to make them while waiting for your reply, they are in the molds in the fridge, will leave them there until morning and let you know how they turn out. I used a thermometer and only heated the mixture to 38ªC. Didn’t have any problem with the mixture splitting or the fat floating to the top, thank goodness. Will these separate if frozen? I’m making a large amount in advance of an event and I’m concerned about the fat separating in the freezer. Hi Alison,I haven’t tried to freeze them, but I think it wont separate if you freeze rolled truffle. And if you dobble or triple the recipe you must stir the mixture a few times while it’s cooling in the fridge or the fat will separate. Thank you. That is very helpful! I’ll do them this weekend and I’ll be sure to post how they turn out. However: I don’t have a double boiler. Is it possible to melt the chocolate + the other ingredients over some hot water in a bowl? The: au bain marie way? Guess it should be okay, but i’m just not willing to spill the lovely white chocolate (there are other, more pleasant ways to get rid of that haha) without checking. Hi Lotte, you can melt it that way, too. 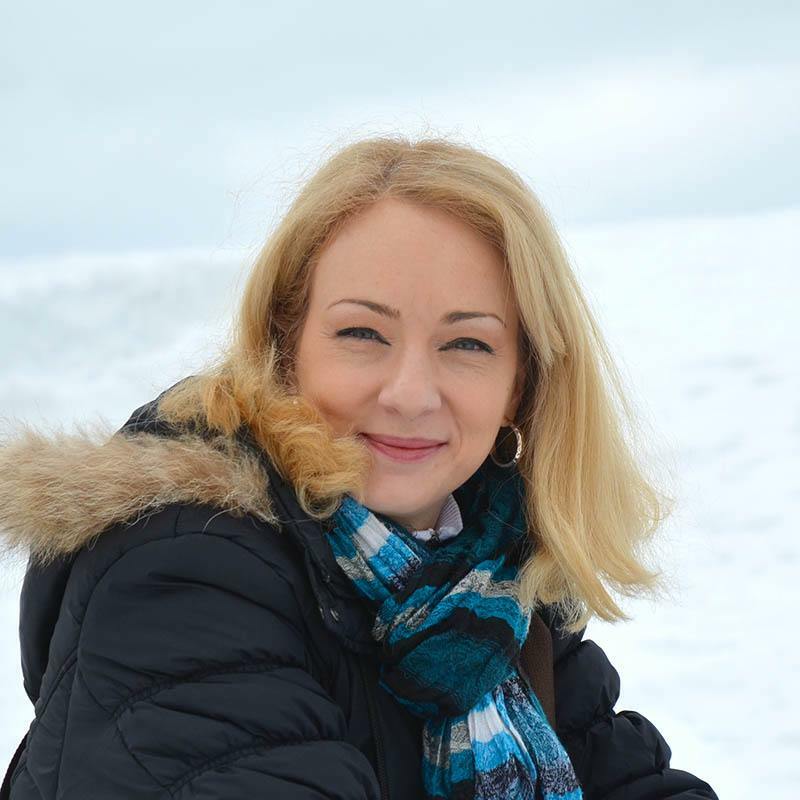 Hi Vera, thanks for your (quick) reply! I am going to have to make them for my friend DeVon. Do you need to do anything different for high altitude? When I found this recipe I just had them. White chocolate is my fav. But when I looked in my pantry I only had white coconut chocolate. Haha thanks so much for the recipe. Thanks Rev, your coconut version sounds great, I’ll have to try it. Good morning! I’m going to be making this recipe this weekend for gifts. Does it make 20 truffles, or 20 servings. Thank you so much for another yummy recipe! Hi Meloni, it makes 20 truffles. Hi I’m making these right now as a trial run for Christmas but I used fresh squeezed lemon as that’s all I had on hand. My 8 yr old lemonoholic sampled the warm mixture and said it’s too sweet but Im hesitant to put more lemon juice in as I don’t want it to get too runny. I’ll finish up here and hopefully they roll alright, but for the next batch should I definitely use lemon extract? I’m not sure how it differs from lemon juice. Will it offer a more concentrated lemon flavour without watering the mixture down? TIA!! Hi Ashley, I hope your truffles turned out OK. Lemon extract gives stronger flavor than fresh lemon juice without too much liquid. I had such high hopes for these truffles. This recipe didn’t set up for me. I don’t know if due to the weather. I’m in Florida and it rained today. Any suggestions for a successful batch? Hi Rolanda, I’m sorry it didn’t work out. I don’t know what went wrong. Can you use white bakers chocolate? Hi Cindy, I think you could use it. Hi, I just want to know how many grs. is 8 oz of white chocolate please? Hi Javier, it’s 224 grams. I tried the truffles; added several drops of lemon and 1 cap premium lemon essence. these taste fabulous. made us all sweetly happy. I actually found your recipe looking for ‘white chocolate lemon truffles’. I advise to use German white chocolate; the type you buy at a bakers stock shop. It would be nice if you can add metric quantities as well for those of us [7 billion people] living in a metric world. I am for the first time going to actually make these. I must say they look good just looking at them. But the recipe is a little disappointing that it uses a very small amount of lemon flavoring. 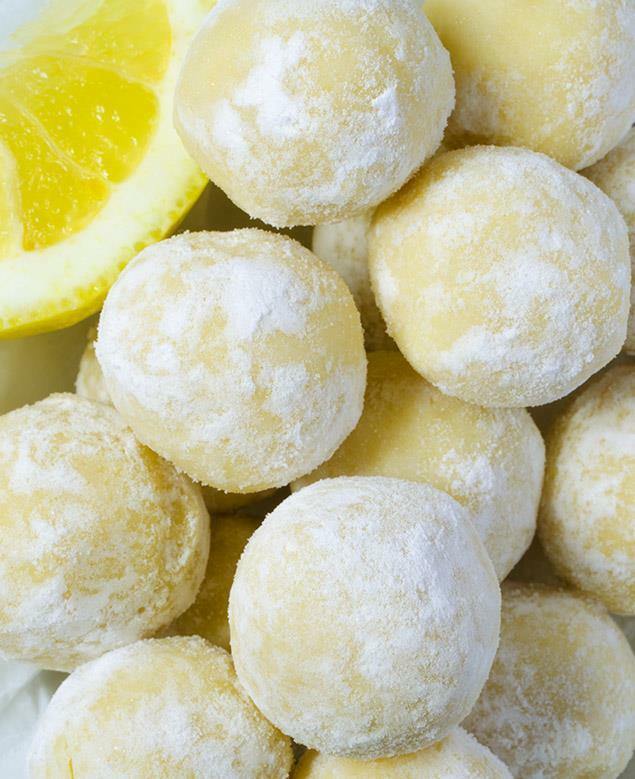 I am a big fan of lemon, so I am not too sure what to expect from these truffles, but one thing I am sure of, is that it will be loaded in fat/butter/chocolate and sugar.but I thought that If you are going to use lemon, I would rather see real lemon juice or rind. anyway going to see if my neighbors like them. Thanks Sarah, it’s 8 oz. weight. 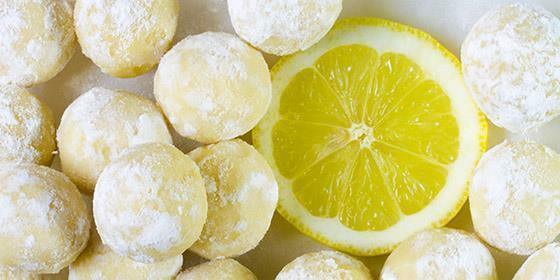 I wonder if you could do these with fresh lemon juice instead of extract? Hi Brigid,1 teaspoon of fresh lemon juice won’t give enough flavor. But you could add grated lemon zest in heavy cream, simmer the cream, stir in lemon zest, let it sit for 30 mins, than strain the zest and continue, as the recipe said. Can I substitute margarine for the butter in this recipe? Thanks! Hi Melanie, you can use margarine. Hi Sue, It’s leveled tablespoon. Hi Tammy, sorry haven’t tried that. I can’t wait to try these. I like that the one recipe works for many flavors. I am working on making these tonight. Currently the the ‘dough’ is in the fridge chilling. However I fear something went wrong. I double checked my measurements before adding anything but it came out very oily. Hopefully it will still work or I can save it somehow. I have never made truffles before so I am learning new things! Can you use other extracts with this receipe? I would like a variety of truffles without have 20-40 of each flavor. Hi Anne, you can use what ever you like.